Some people walk into a home for sale and immediately know it’s right for them. Others need to think it through a little more logically. If you are hunting for homes in Midcoast Maine and need a little help determining if a home is right for you, we’re here to help. At The Morton Group, our local real estate agents will listen to your needs and wants in your future home. Based on your budget, needs, and desires, we can help you find the perfect home. However, even if a home checks all of your boxes on paper, it might still not feel right when you walk in. Below, we’ve outlined a handful of elements that might help you realize if a home is the one. Keep reading and ask yourself if the next home our real estate agents show you checks the following boxes. You might absolutely love the location and style of a home, but if you have four kids and the home only has two bedrooms, it might not meet your needs. Make sure to talk with your Maine realtor about what you absolutely must have in a house and what you can compromise on to ensure they are only showing you homes that will fit your needs. If you need a certain number of bedrooms, a first-floor suite for inlaws, or a backyard for your large dogs, you’ll know a home could be the one if it has everything you need. The last thing you want is to fall in love with a home you can’t afford. Let your real estate agent know what your desired budget is and what your absolute top-line is. If you happen to see a home that is beyond what you can afford, then it’s not the home for you. But don’t worry, because your perfect home is out there! If you find a home that you love and it is in your budget, it might be the one. Homebuyers always say they would like this or that, but if a home doesn’t have it, it’s still okay. As local real estate agents, we know that there are usually a few things they say they’ll compromise on but that they secretly really, really want. Whether it is a walk-in closet in the master bedroom, a brand new gas stovetop, an open-floorplan in the kitchen, or main-floor laundry, finding that one thing that you really wanted can indicate it’s the house for you. Are your ready to find your dream home? Let us help! Have you ever seen a home that just feels weird? Maybe you’re afraid to touch any surfaces or there’s a funny smell that you just don’t think you could get over. Maybe the way the kitchen is arranged makes you feel claustrophobic. Unless you are planning to renovate a space anyways, make sure you feel comfortable in a home. Imagine yourself five years from now in this home. Does anything look different? Have you painted a wall or placed a big rug in the living room? Can you picture your kids or grandkids playing in the backyard? If you can visualize taking this house and making it into a home, it could be a good sign that your gut is saying it’s the one. When buying a house in Midcoast Maine, you have a lot of communities to choose from and each offers something a little bit different. If you want to live somewhere ultra quiet, then you might want to stay away from Freeport. However, if you commute to Portland for work every day and you always want something to do on the weekends, then Freeport could be a great option. You can always update your home down the road, but you can never change the location. 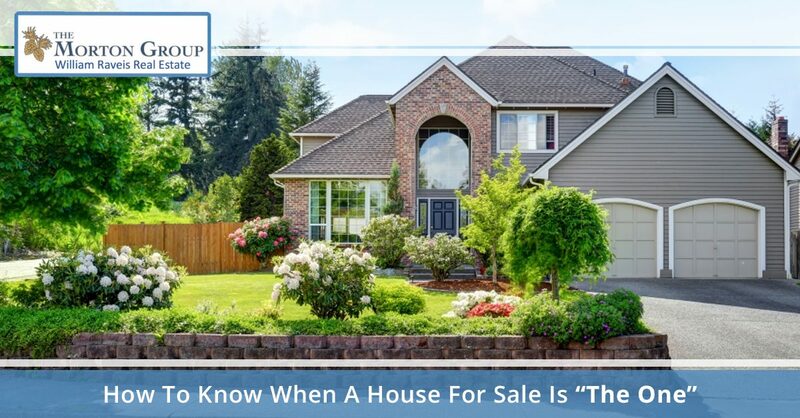 So, if you are unsure about the location, let your real estate agent know and they’ll pinpoint what it is you don’t like about the area and show you homes in a place you’ll love. Let’s say you had a briefcase full of cash that equaled the exact asking price of the home. Would you hand that briefcase over to the current owner right now if it meant you could live in that home forever? If you would buy the home on the spot, no questions asked, then you might have found the one! With so many beautiful homes for sale, you’re sure to find exactly what you’re looking for. And if not, you can count on the Midcoast Maine real estate agents at The Morton Group to go the extra mile and help you keep looking. Buying a home is a big investment and you shouldn’t purchase a home you’re not 100 percent certain about. If you see a home and have any reservations, be sure to discuss this with your agent so they can adjust their strategy. If you’re ready to find your dream home in Midcoast Maine, then get in touch with The Morton Group or browse our Maine real estate for sale.